Click the button below to add the Condux 08763230R WDR505 Hyd Cable Puller Trailer W Compressor & Remote to your wish list. 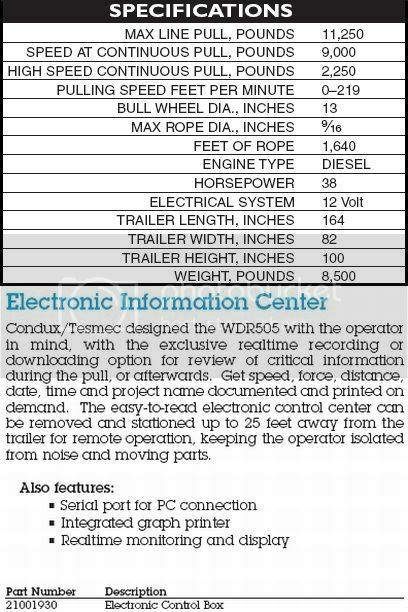 The Condux/Tesmec WDR505 Hydraulic Underground Cable Pulling Trailer Provides up to 9,000 lbs. of Continuous Pulling Power to Tackle the Toughest Underground Pulling Applications. Designed for Installing Underground Cable, the WDR505 is Completely Self Contained and Transports Easily From Jobsite to Jobsite. Industry Leading Features like Anti-Twist Rope and Modular Extension Arms Make the WDR505 the Most Advanced Puller on the Market Today! An Advanced Electric Information System is Also Available for Monitoring and Documenting Vital Pulling Functions. The WDR505 is Precision Manufactured to the Highest Standards. Each Puller is Backed with Years of Underground Cable Pulling Experience and a Commitment to Quality Customer Service. Standard Features:Closed Hydraulic Circuit for Stepless Speed Variation in Both Rotating Directions, Negative Self-Acting Hydraulic Brake, Hydraulic Dynamometer with Set-Point and Automatic Control at Maximum Pull and Hydraulic Oil Cooling Systems.The Noise Reduction Trailer Comes Standard with Torsion Axle, Electric Brakes with a 7 pin round connector, and Electric Breakaway Kit, Pintle Eye, Safety Chains, Job Box and Light Kit. Built-In Reel Winder with Automatic Level Wind 13-3/4" Bullwheels Air Compressor Included.The Air Compressor is Rated at 185 CFM at 120 psi, 20 Gallon Diesel Fuel Tank and the on board toolbox is fully enclosed. Chandler Equipment Sales has been selling new and used construction tools and equipment for 25 years. We are Authorized Distributors for Condux International and many other manufacturers.